I am so torn by this book, even after the length of time between this review and reading the book. Sarah J. Maas is an amazing writer, portraying in depth characters and well structured worlds. They're both fascinating to read about and also memorable, which I really appreciate. I loved Feyre for her strength, perseverance and her independence. She was skilled and smart, but lacked the nurturing she needed. Once she had that assistance, she blossomed and I could see the development, which I really enjoyed. I fell so hard for Tamlim, even though I hate anything to do with Stockholm Syndrome because it feels so wrong. There was so much intensity between them and their relationship development, albeit it was almost like insta-love. By the end I was rooting for them so hard though - so many feels!! The world did and will grow as the series progresses, which I love the most as I read any fantasy based novel. I learnt so much and it was kept interesting by the different regions supported by the different creatures of the land. The magical elements to them were very fascinating and worth learning about, and I'm glad Maas put a different spin on faes/fairies. Her writing excelled in some areas, but in others I was left feeling unsatisfied. The plot jumped around a lot and tried to fit a little too much into the 400 pages. I understand that it was trying to cover background information as well as set up for a sequel but the beginning felt abrupt, and in between that and the climax it was drawn out for way too long. There was a lull that was suppose to build up to a suspenseful climax but I just felt really bored after awhile. The ending was thrilling but because they had left it until too long it was rushed and I couldn't appreciate it as much. I was also slightly bothered at how Feyre reached her solutions through constant help from a certain male character, because it reduced her character to merely just a damsel waiting to be guided by a knight. 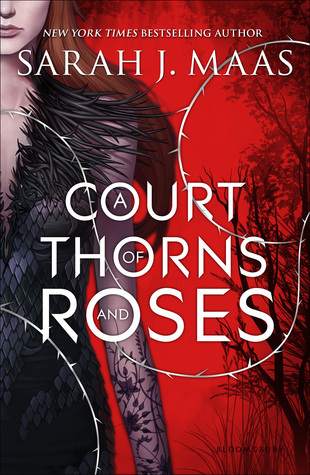 A Court of Thorn and Roses is an interesting take to Beauty and the Beast because of the change in the world and creatures explored. However, I wasn't totally won over by the entire story finding it an okay read amongst other fantasy works, especially with Maas' other novels. I do know it's an immensely hyped up series - everyone seems to love it - but it just wasn't for me.